A long, wormlike, sap-sucking mite is now one of the oldest creepy-crawlies found preserved in amber yet, researchers say. Insects, spiders and other buglike creatures make up a joint-legged group known as the arthropods. The earliest members of the ancestors of flies and wasps originated near the start of the Triassic period about 250 million years ago, but much remains unknown about the evolution of these and many other groups of insects during this distant era. One way to learn more about prehistoric life is amber — fossilized tree resin. Before it hardened, this ooze often dripped over bugs and other wildlife perched on its tree’s bark, entombing them for millions of years. “Amber is an extremely valuable tool for paleontologists because it preserves specimens with microscopic fidelity, allowing uniquely accurate estimates of the amount of evolutionary change over millions of years,” Grimaldi said. The researchers analyzed about 70,000 droplets of amber, each 2 to 6 millimeters long. Droplets of Italian Triassic amber. Despite these challenges, the scientists discovered three arthropods. One was an insect, a midge fly, whose head, antenna, pieces of body and at least four legs suggest it was altogether just 0.06-0.08 inches (1.5 to 2 millimeters) large, or about the size of a pinhead. The other two arthropods in the amber represent two new species of mites. These are miniature relatives of spiders, although these specimens both evolved to lose two pairs of legs. One of the mites, Triasacarus fedelei, is just 210 microns long, or about twice the diameter of a human hair. Its distinctly wormlike shape suggests it may have lived in a tiny space that protected it from drying out. Its mouthparts are less fused together than the hypodermic-needlelike feeding structures of its modern counterparts — “these are probably an early progenitor of modern-day gall mites, a primitive form,” Grimaldi said. Typical amber droplets. For a study released on Monday in the journal PNAS, researchers screened 70,000 drops, resulting in the three arthropod inclusions. Scale bar: 1 mm. These mites are unexpectedly similar to their closest relatives, modern gall mites, creatures that feed on plants and cause abnormal growths known as galls to form around them. The ancient mites probably fed on the leaves of the extinct species of conifer tree whose resin ultimately preserved them. These fossil mites lived before the appearance of flowering plants, which about 97 percent of today’s gall mites now feed on. The scientists detailed their findings online Monday in the journal Proceedings of the National Academy of Sciences. The late summer and early fall are popular times for people to flock outdoors to enjoy the summer sun. Unfortunately, it is also the most active and aggressive season for stinging insects including wasps and yellowjackets, warns McCauley Brothers Termite & Pest Services, a pest management company servicing Northern California. Whether completing home maintenance projects or attending a holiday cookout, anyone spending time outside during the warmer months is likely to encounter stinging insects. These pests are known to dole out painful stings, which can be life-threatening to people who have an allergic reaction. In fact, the National Pest Management Association, a nonprofit organization committed to the protection of public health, food and property from household pests, reports that stinging insects send more than half a million people to the emergency room every year. Do not attempt to remove a hive or nest on your own. As it turns out Flikr is good for more than just sharing photos with your friends. A new Lacewnig species was discovered on accident on Flikr. As engadget exclaims in the article below. 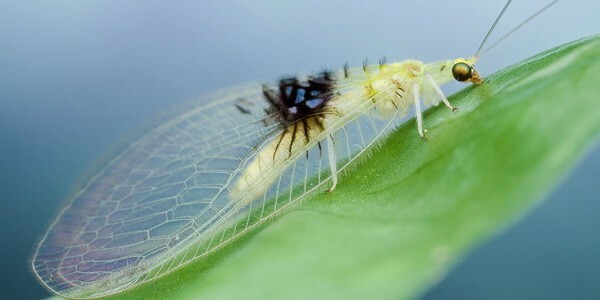 Entomologist Shaun Winterton has discovered a new species of Malaysian Lacewing from the comfort of his computer. Idly browsing Flickr, he came across Guek “Kurt” Hock Ping’s snap of an insect taken while hiking in the Malaysian jungle, which bore an unfamiliar black-and-blue pattern along its wings. When his colleagues couldn’t identify the markings, he realized he was staring at a new species and hurriedly emailed the photographer — who, a year later, had captured one of the elusive creatures. Sent to Simon Brooks at the Natural History Museum, the suspicion was confirmed. The armchair explorer named it Semachrysa jade after his daughter and promptly used Google Docs to co-author the paper with Guek and Brooks on opposite ends of the world. If your mom complains that you’re spending too much time on your computer, you can tell her you’re searching for strange life-forms and old civilizations with a straight face.